TCN | Walkable cities are friendlier – but what if climate change makes it too hot to walk? 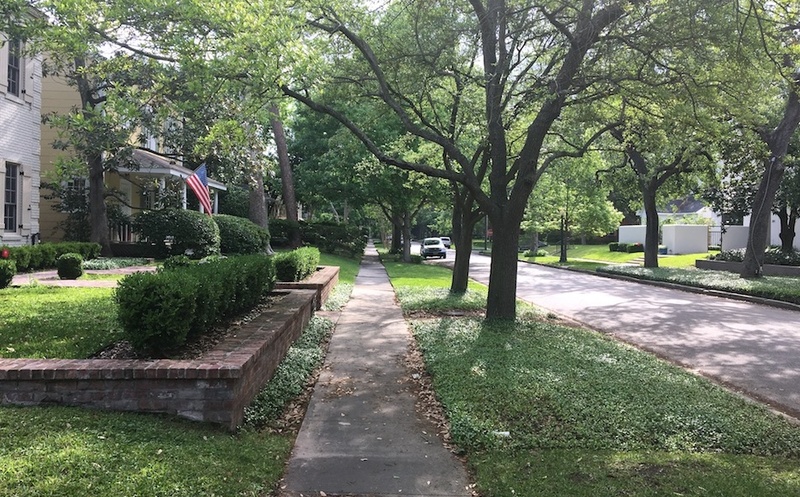 A sidewalk in an older Houston neighborhood is shaded by trees. Read anything about the New Urbanism – which seeks, among other things, to design cities for people as well as cars – and the notion of walkability strolls up. The movement advocates swapping post-World War II sprawl for “walkable blocks and streets, housing and shopping in close proximity, and accessible public spaces,” as the Congress for the New Urbanism puts it. Walking to stores, parks, work or transit stops cuts vehicle pollution and gives inner cities a much smaller carbon footprint than suburbs, research shows. Green space also helps reduce childhood obesity and improves mental health and social welfare. Walkability is on the agenda in many Texas cities. But what if climate change makes it too hot for people to walk safely? Just a few added degrees can turn a healthy walk harmful, studies have found. Heat stress “may prove to be one of the most widely experienced and directly dangerous aspects of climate change,” Columbia University and NASA scientists reported last year. Global average temperatures last year were higher than the 1951-1980 mean by 1.62 degrees Fahrenheit, according to NASA’s Goddard Institute for Space Studies. A wet-bulb globe temperature (WBGT) of 90 degrees F is often pegged as the highest safe reading for outdoor activity, and even that would allow no more than 15 minutes of exertion followed by 45 minutes of rest. WBGT is more complex, weighs more factors and is considered a better safety marker than the more familiar heat index. The theoretical limit of human tolerance is a WBGT of 95 F.
Not many studies have looked at how to factor increasing heat into walkable urban design; a few more have quantified how some nearby greenery can help. One paper, by scientists at Texas A&M and two other universities, appeared in the January issue of the International Journal of Environmental Research and Public Health. Researchers took thermal images of 10 sidewalk segments in College Station that had different landscaping. Some had no trees or grass, while others had variations of trees only, grass only, and trees and grass. The study aimed to quantify how much of the green stuff is needed to moderate the heat blasting off the pavement. The findings aren’t surprising: Adjacent shade and vegetation cool the air where people walk. Unlike similar studies, this one also checked temperatures at lower elevations where children encounter more heat from pavement. Having some greenery nearby reduced children’s extra burden, the study found. The paper’s authors emphasized that the study is limited and local. But with growing demand for human-scale city habitats, and with the planet still heating up, people will have to find out if walkable urban design and climate change can coexist.